No material change in the counts since yesterday. The S&P 500 (SPX) daily chart shows another indecision candlestick: in this case a dragonfly doji. This candlestick foretells of a reversal roughly half the time -- in other words, it's pretty random. However, it does indicate an undecided market. On the daily chart below, I've annotated some of the nearby support and resistance zones, both long and short term. There is significant resistance directly overhead right now, so a consolidation or reversal may be in order. Conversely, a breakout through this zone would target 1370-1380 next. The market is also at something of a crossroads between the pink channel and the green channel. A breakout through the top line of the pink channel could indicate there's still a fair amount of momentum left in this move. The 10 minute chart is unchanged from yesterday. If a top is going to form here, it may take a few sessions. As I've said before, tops are usually a process; whereas bottoms are usually an event. Again, until the trend channels are broken, there is no objective indication of a trend change. The chart below shows the Nasdaq (COMPQ) daily and notes that the rally has again reached the underside of the old upsloping trendline off the March '09 lows. It also notes how overbought the market has become (in technical terms: "just a tad"). If the Nasdaq breaks though this level, the next meaningful resistance doesn't come in until around 3040 or so. There is simply not much to add after yesterday's action, which was essentially just a sideways/up grind. The market has a lot of options for its next move, so until it either breaks out or breaks down, there's no real way to project what happens next. The market's as overbought as it gets, and has been for some time -- but an overbought market can always get more overbought. If the Minor (2) count is still valid, then now's the time for the rally to end -- but the market did nothing yesterday to add or subtract confidence from that count. So at this point, we'll simply have to watch overhead resistance and the lower support zones for clues to the market's next move. Trade safe. Thanks PL - waiting and watching. We are now sitting right at the bottom of this megaphone line, a make or break time. It measures to 1335.50 ES. WWWCI fired off last nite calling for 1360. Indecision or not, the bulls are already celebrating. timeframe in chart ES 120? Huummm, usually aways (oxymoron) a bounce up off the megaphone TL. Broke straight thru? Setting up for a back test? Or to continue its fall? See how accurate the WWWCI is, sometimes there is a time delay of up to 24 hours but usually it works well within about 3 to 6 hours. A call for 1360 $SPX did the trick. WWWCI call for gold to 5,000$ and oil to 150$ signaled the exact top, cannot do better than that. whhooooaaa lena. we are looking for mrkt to go down not to rise ! Thanks Katzo....For the first time, I actually believe that this rally is being exhausted for too many technical reasons to mention, in addition to the several "events" that are lining up. Now will the rest of the participants agree, or will "they" keep trickle charging the bids? w/positive follow-thru only 35% after 1 wk, 55% 1 mo, 50% 3 mos." Morning everyone. Looks like we have a giant game of 'chicken' on our hands. Greek politicians holding threat of country's chaotic bankruptcy over everyone's heads, daring the troika to withhold the bailout funds needed to avert that scenario. The Greeks will never give in, so just a question of whether the other EU nations have the stones to force them to default or if they will capitulate and throw more money their way even though they don't put through all the asked-for reforms. Thanks PL for your rational and pragmatic approach. It is appreciated. keep this out of that megaphone and e have a good chance. megaphone now measures 1335.50 ES at bottom TL. Looks like we have a giant game of 'chicken' on our hands. You are absolutely correct that the Greeks will never capitulate. Long term, I think it makes sense for Greece to want to default. It's the Euro nations that will not let it default because they want their money back. If Greece defaults, they will have to struggle for years, but they will get a brand new start with a weaker and more competitive currency. Greece should want to default. If they actually default, it may take more than meetings to get money/property from Greece. Don't try to call it...just play it. You know how to do it. I swear to God futures are the only vehicle to play this thing. If history repeats itself, we have a week or two (or three) of this before everybody catches on that "uh oh...this is BS". I am going out on a limb and saying the high is in. My only concern is that the opening bell tends to be positive and someone erratic to predict, we could hit an EW5 top of 1345 ES during that time, I do not think so tho. On the 60 ES chart, we are gettin' a curl in the 20 MA, a cross of it with the 50 MA would verify my call. Look back at the 20/50 MAs on 2/03 at 6:00 and 2/01 at 3:00 and you will see two kisses of the 20/50 MAs. Three times is the charm. A cross and then I will breathe easier being on the short side. As well as breaking the megaphone TL, we are now sitting on the TL of my triangle on the 60/120 minute. On the 60 minute ES now. Since that time twin pipes have developed (some call this tweezers) up at that gap fill. On the 120 the EW5 has slip over to 20:00 with a gravestone doji. Gold continues to fall, not sure I would call it a leading indicator but it is working better IT in that capacity now. Problem with this concept is that if Israel lobs a missile or two at Iran, or if Iran bottom feeds the Suez with ships gold and oil shoot higher and $SPX falls rapidly breaking any leading indicator relationship. One time when the news will precede the mrkt. But now the parallel seems to be working better. no, a tick count, experiment around and see if you can find it. All that's certain is that once it does turn, every pundit will proclaim that they 'saw this coming' due to the market being so overbought...:) Hopefully we can close below 35.5 today. I'm still completely torn on gold LT. Undecided if the 1900s top was 3 or 5. Even if it was 3, gold could still see the 1300's on a correction. $VIX up 3.86%, plus WWWCI call. If I could actually stand looking at or listening to Cramer, I'd love to see his face...but he will be two weeks late anyway, and probably be calling sell half-way out of the bottom (like he's told to by GS). I agree with trying to define the top, now down is the direction tho. . .
My take on gold short term is minimum 1642-1670 on this move. If it breaks that LT rising trendline, then I would look for the low 1500's... if that doesn't hold, then the low 1300's. All of this could still take place within the context of an ongoing bull in GC -- even if the peak was only wave 3.
triangle on the 60/120 minute." We are not sitting on the ED TL but sitting on a GANN line (35.50 ES). We are 1/2 the way there towards the ED TL tho. It is sitting right on daily support at the moment, though. So breaking that would be the first step. Back above 1761 would potentially negate these projections, obviously. I'd really love to see ES make two marginal new swing lows prior to rising above 1337.25. That would be a confidence builder in an impulsive move down. Twenty days out of 50 years is a pretty teeny fraction of the total, but that strikes me as less than a coin toss probability-wise. If markets tend to rise about 2/3 of the time -- as evidenced by the proverbial staircase up, elevator down pattern common in stock charts -- then one might expect to see at least a slight positive bias in any comparison of a statistically significant set of randomly selected days on a price chart with prices some fixed number of days following each -- particularly between any two days 3 months apart. Yep, that's what I was thinking when I wrote it -- especially since it's an election year. Israel is going to need a very large missile to get to the underground installations unless they go nuke, so I would be more inclined to see an event occur in Israel or U.S. that would green light a *massive* conventional airstrike with heavy bombers (B-52) capable of carrying a 10,000kg bunkerbuster. Cruise missiles would only be used for prepping SAM sites. Plus, deals have to be made with the Saudis for continued cheap sweet, and Egypt has to be kept out of it. I'd go for the scuttling in the Suez first...I wouldn't be surprised if the ship's name was "Maine". Still I think the Greek are afraid of the Turks enough to cave. But in the end, who cares. Greece is important to the Greek. For the others just a nuisance. The firewalls are build and in place. Yep, that's why I switched to futures years ago. Just seen it and planned to tell everyone that it may go to 1338 ES. 1337.50-.75 is a must hold otherwise we head for 1345 ES. The bear should hold it below 1336.50 ES. Now, it's a tug of war. By the way, today's pivot is 1336.50. It's very interesting, isn't it? You mean the strait of hormuz, I guess. €/$ leads the way today. Will be more of long for me. I'm going futures after the big down occurs. I should be well-capitalized by then. In current situation, there is a very high chance that the market will make a new high again today, imho. The action of ES about 45 min ago has given a dangerous bullish sign for today's market action. Just cheched the news and seems that big boys took the action before everyone as usual. ES 1338.25 is/was EW4 level on some short term charts, that is the must hold area for bear count to work. . .
awe Crap...now I'm certain to get a reminder. double Crap...now I shall have two reminders. Imma put my orders on autopilot. I need to walk away from the computer for a few and eat something. After staring at it for like 12 hours straight, I start to feel a little stir-crazy sometimes. Be back in a bit. Your fellow Minyanviller Chris Vermeulen had a great line this morning. He pointed out that "greed is simply slower to reverse than fear"... well I thought it was a great line. Any thoughts on what is happening (or more importantly what will be happening) with the U.S. dollar. It looks like it has fallen way through the bottom of the "blue melt-up channel" suggested in your 01/15 update. The guy I pay for timing advice said on Monday to switch from long dollar to short dollar funds -- just wondering where you see it. Thanks. Looks like the adults are back in town today. Maybe yesterday was just another holiday-type session. Hope your autopilot has as a big a smile on its face as the one from Airplane!, when you get back. Will do...The Chinese were right. 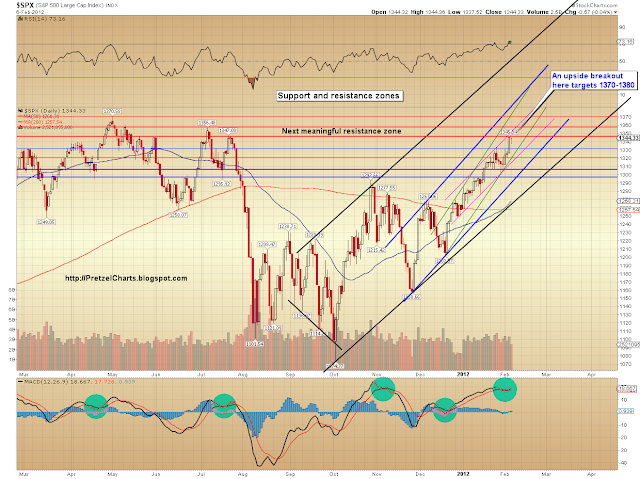 Is it me or I get the feeling this thing is getting ready to burst through $INDU 12876? Purchased JPM Feb. 10th 37 puts @ $0.13 Not trading advice. Please manage risk and trade safe. Eur is exploding higher (1.3240), i am now long from ES 1339. I went long a few minutes ago also. Back in short at ES 1341. Glad I covered when I did. Tight stop on this one. It's a powerful wave 3 up and just at its first stage, min target is 1351 SPX, be careful and trade accordingly. Glad I bailed, too. Any hesitation in this market and you're toast. Be happy to take a loss. Thank you so much for your target! Appreciated it. 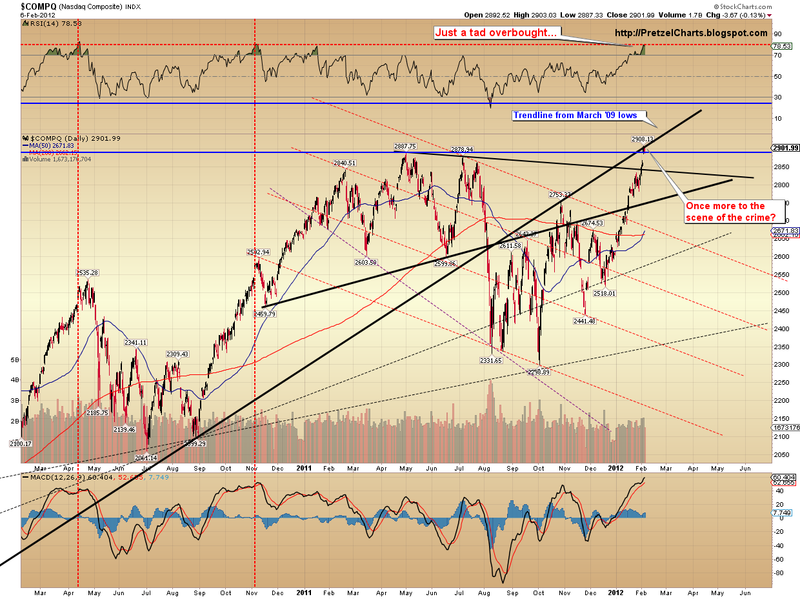 DOW passed 12876, does it have to be on closing basis to invalidate the bear count? Dollar is in the process of breaking a support level, so it could drop a little. Be very careful of it around the trendline connecting the August and October lows. I would expect it to find support there, if not sooner. Nope, Dow count is busted. Yeap... Back to the drawing board....12878.88 and getting ready for more...well...this has been fun learning... back to classical monthly average investing with quarterly re-balancing. Cost me the equivalent of an MBA to learn EW is just another way for market to toy with small fish.... (sorry for the venting). I covered 1/3 position for 2pts, have SL at 1339.25 for the rest. Looks like DJIA briefly tagged 12878, not sure how meaningful that is? I'm actually hoping today is up big on big volume, that would make me feel better about a top being put in. btw. I'm just trying to help. Don't take it as trading advise and manage your risk carefully. Actually, it was a setup around 5:30 PT or 9:30 ET. I felt strongly about it and have told everyone with my post below. I'm happy 'cause I took a profit. :) Not a big one, but 6.5 points isn't terrible, either. Wouldn't be as happy if I took a loss. But a small loss always beats a bigger loss. Might have to take a small loss on this trade if it heads back up again. I took profit at present level. Upside profit netted start of day loss on short side, net to zero. Just watching at this point. NP, I'm all cash at the moment. 3 doesn't have to be longer than 1. It just can't be the shortest of waves 1, 3, and 5. Also, I have no clue which iii you're talking about. If you're talking about the final iii, it actually is longer than wave i. And BTW, I view all market actions nowadays as controlled by bots. I try to observe the bots' tendencies. I am presently not subscribing to theories about waves, but just using linear channels. Seems to fit the bots' modus operandi. So in hindsight, I closed my long position at exactly the right price and time. A brief of pullback may be coming, it's a good chance to re-evaluate your trading strategy today. 1350 to1370 is a magnet. Sorry PL, counting error myside.. Yes, everyone has edges to trade. It's not neccesary with EW. You just go with whatever you think it's a good edge after backtest it carefully. I can't believe how the market responds to Ben. Incredible. Central Planning. Not Free Market. Anyway, I'm back in on the long side. A bot will start up at 11:28 and I'm betting it will push prices up. I thought that was yesterday's, last Thursday's, and two Monday's back's rumor. dle7319 ... See, one of the bots pumped it at 11:28. Next pump will be at 11:40. Next will be at 11:57.
me too...dumped both sides this morning at almost appropriate times. Waiting for settlement so that I can enter and exit at will. DD, where are you getting your bot reads? Yep. Out for -2. Time for bed soon. Yes, it may go on and on until the end of the day, it looks like that for today... Someone must feel lucky when it has a brief pullback to get in or cover. PL - What are the implications of DJIA busting through its minor 2 count on SPX? 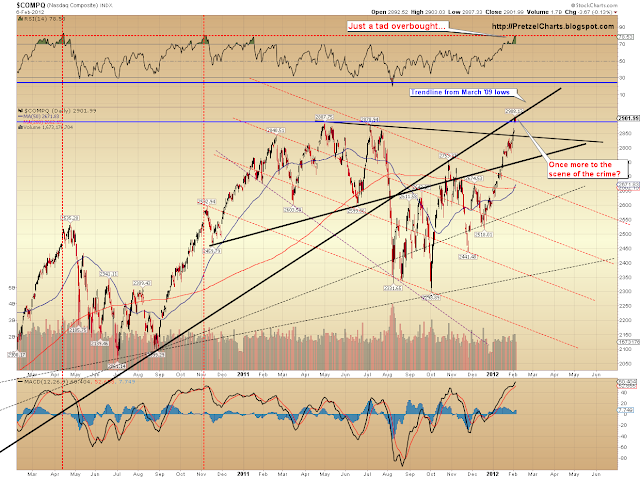 Higher probability that SPX will bust through 1370s as well? From a tool called Flux Pro. It's proprietary and I'm not allowed to post charts from it, as per the license agreement. The bot times are from historical data mining over 60 days. Eur giving up some gains here, closed out longs and went short at 1343.25. But if it doesn't take a breath here in next 5-15 mins, I will close out the short (or if it trades 1344). I think Awfkung's hypothesis of the slow bear squeeze makes the most sense. Somebody has figured out a way to program a bot to cycle bears. Spend e dollars to do a pump. Extract s dollars from bear squeeze. Profit from s > e.
IMO, yes that makes it higher probability. If SPX breaks out above 1350, it targets that level anyway -- but that's a very aggressive buy trigger w/ the market this overbought... tough market now for all but quick plays. When I see slight downdraft like at present, I'm thinking: These are the non-robotic participants selling. In five minutes, a robot will come in and take their money. Dow jones transportation index down slightly when market up, can sometimes lead to market reversal. Thanks. 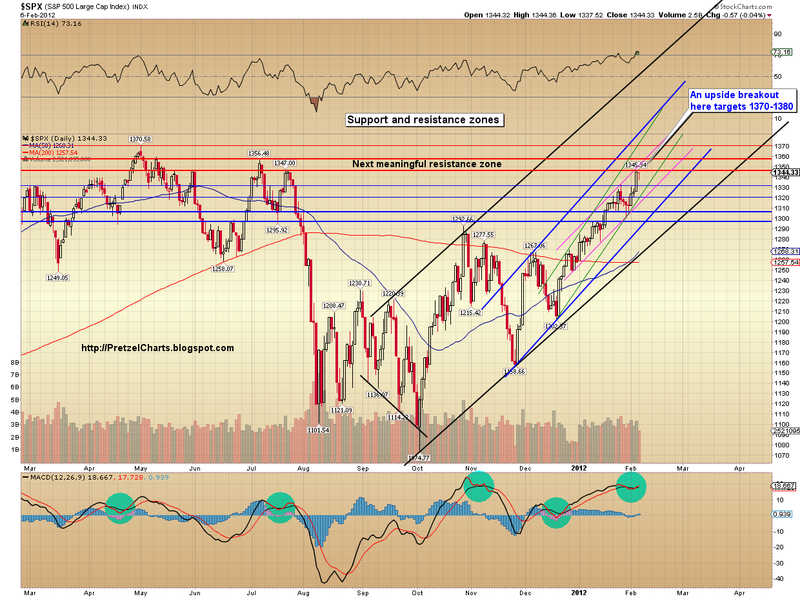 Do you have a preliminary upside target range for DJIA after the minor 2 bust? Now I want to see what EUR does from here. It could retrace back up to 1.3260 area or it could roll over. Whatever it does, i expect equity market to roughly follow. I suppose it's to be expected, since 95% of traders go bust, regardless of what system they follow -- but knowing that fact doesn't make it easier. My options express was soooo freaking slow I missed the offer at 1342.25 as Eur took off again. I am not chasing it. OK, the 11:40 and 11:57 bots did not run. Next up are the 12:09 and 12:36 bots. How I wish so too Pretz. The problem is that not only did I miss the October bottom but I actually SOLD longs when the print screamed bear market (right at the -20% to the penny) and started trying to catch up with shorts. So I was big-time whipsawed. If I could have only found you in late september....now I'm protecting capital mode (whatever is left of it anyways) and will suffer this rocket rise to B (hopefully) or even worse to GSC 5 on the sidelines afraid to even attempt a Long. need to reevaluate my trading strategy. was up 40% to down 20% on my account this year. any suggestions on being nimble with less than the 25k day trader req? Really? I've pretty much never missed an entry/exit. Of course, I don't trade EUR much -- that's a very crowded market, lots of big orders ahead of you. I'm using options as a proxy. Works for me. Not every bot runs on any particular day. What is important to observe is whether bots that run are running to sell - if you have long position. So far, the majority of the bots running today are buying. Mainly you have to super-fine-tune your entry/exit strategy. Been awhile for me since those days, and honestly, that's a much tougher gig, IMO... especially in a market like this. Not much of a trend channel today, so I'm now paying attention to the MAs on the 15 minute chart. But swing traders basically are forced to take bigger losses -- goes with the territory. Even if you were long in this market, it runs down enough to clear out all but the widest stops, or the really good entries, then heads back up. true, not having a round trip cost me 10 percent one day. I printed out that article where you outlined "preserving capital" but I got too busy trying to get to that 25k market though excessive leverage. Rookie mistakes. But at least it was now with my small account rather than when in the future when I have more capital to loose. Is there any significance of two consective harami crosses? That's the situtation in the daily Russell 2000 chart now (of course assuming that we close around here). Or is this just a rest stop? Thanks.
."...........some of these CDS are written against various swaps or stock indices, meaning that the asset to be delivered upon default is ultimately a claim against stock indices, currencies, etc............Prudent institutions aren't waiting around until the dominoes fall--they're buying the underlying assets( including stock indicies) so they can meet their CDS obligations. That's the only way not to topple into insolvency when the default causes CDS to be recognized as due and payable." while driving to work it broke my 1338 level so 1345 ES was tgt. my puts are on high flier stocks of what I think are broken charts. guess we will see. Ah, R911 -- you have no idea how much headache that KO adds to my work. This is going to be a trendline and trade-trigger market for a little while. Anything but short-term targets will be a challenge for the very immediate future, until the market rules out some of the myriad options. In time, there'll be more clarity. yeah, transitions are very tough, mrkt is the ultimate Professor and will test your position size and timing. . .
Russell 2000 underperforming S&P 500. Risk off? Apparently, e-Mini index futures aren't subject to the $25k pattern day trader requirement. is bernanke still testifying? maybe mrkt tanks after he finishes up. just getting the feeling we close red today. . . If I remember right, this was the case yesterday too. I think 12:36 will see a rally. Closed all short positions once the Dow broke through. Everytime I go to the grocery store I almost sht myself at the checkout counter. I thought all margin accounts are under the $25k requirement for day trading. If this is true, expect a nasty liquidation event as Greece nears default. Bernanke said, "Interest rate? What interest rate?" Ouch, that stings, selling at the bottom in October. I know you've probably figured this out by now, but "revenge" trading never works... at least, it never did/does for me. Too much emotional investment on "getting back at the market" clouds the trade decision process. nope...futures...in and out all you like. whoa, knowledgeable adults back in town again. Seems that they've made some good trades while other children is playing with dip holes and a lot of headaches at this moment. lmao. You don't say! I'll have to look into that, then. RUT doesn't have AAPL holding it up. The market is flat because KatzoBot is having chinese food. What's your count so far, dle? No matter what the reason for the perma-bid might be, this remains a dangerous market to short. That eleven point move upward from 1,336 to 1,347 is the largest intraday move upward of this rally where the move never retraced by even one point. And it came after a fakeout waterfall open. As we've seen so many times before during this rally, the bid under the market got flipped back on like a switch . . . and wiped sellers out with barely a yawn. DAILY VIX OPTION TRADES: Here is a glimmer of hope for my fellow VIX fans.. Upside potential on a big trade today. 25K VIX calls bought on FEB 35 calls with a week left till expiration. That betting the VIX doubles in 5 trading days.. Big play..
akwfung, it's wave 3 of wave 5 up... but I may be wrong. It seems unreal, doesn't it? Nope, but the 13:08 bot seems to have a slight effect of riding the up channel. This channel only has a Pearson R value of .73, but still. This makes sense. It may explain why Bernanke made such a strong statement today, insisting to 'protect' the US financial system regardless of what will happen in EU--like he's expecting something bad to happen with EU. Also in the McClellan video that someone posted last night, the guy seemed to imply that the market between now and June can be really crazy, and only nimble traders can be in. Other investors should get out and come back in June! For how long? can't like the market now, but you certainly called it right this morning! Kudos! I so hope McClellan is right. Big money in them swings. Excellent article; thanks for posting. This would explain a lot of the nonsensical behavior in the markets lately with the underlying perma-bid as well as the ignoring of resistance levels and grossly overbought conditions. The way I read it, this rally could very well continue until Greece defaults. In fact, the closer we get to default, the steeper the rally may climb. Very interesting. That is a big play. I wonder if it's someone that knows something or someone that is making a last desparate attempt at the casino. We'll see how it pans out. It's gotta be less headaches...I could throw away my calendar. Try that one again....What did Uncle Ben say? Sniff sniff.. i smell volatility? Other way around. 3 *cannot* be the shortest of 1,3, and 5. Doesn't have to be the longest -- just can't be the shortest. Yep. My interpretation of his logic is that markets can ramp as underwriters buy the underlying collateral instruments to anticipate having to cover their obligations, but at some point, they will have to liquidate the collateral itself to pay up. Perhaps this is the event that is the nexus between the massive derivatives market and the 'real' market - with one about to take down the other. Anyways, its better to trade the trend and always wait for confirmation - these things can go on for a while! Next bot scheduled for 13.41 and price is reaching bottom of trend channel. I expect a rally. Interesting action in VXX and TVIX today.. They are Not tanking when the market turned Green?? call the news channels.